I’ve been getting into powders lately. Kool-Aid, Jell-O, baking, freshly fallen yet uncompacted snow, the 1995 movie starring Sean Patrick Flanery and Jeff Goldblum. Ok, maybe not. It’s really just been Kool-Aid and Jell-O. I am fascinated to no end by Kool-Aid and Jell-O. Besides their excellent use of hyphens, they are like glrious little edible chemistry sets. Especially Jell-O. Come on. There is a special joy that comes from mixing water with a brightly colored powder and having the result be a glistening, jiggly, radiant jewel of fruit-flavored ecstasy. I might be overselling that. But still. It’s pretty great. And there’s always room for it. Both of these powdered food products only recently re-appeared on my mental horizon. Sure when I was a kid Kool-Aid and Jell-O were the bee’s knees. But then I grew up. And as you grow up, you put away powdery things. That’s in the bible. Why do we that? Are we too good for Kool-Aid? Too adult for Jell-O? I say nay. We are not. Certainly I am not. So in the coming weeks I may be launching a series of posts dedicated to the delights of both. 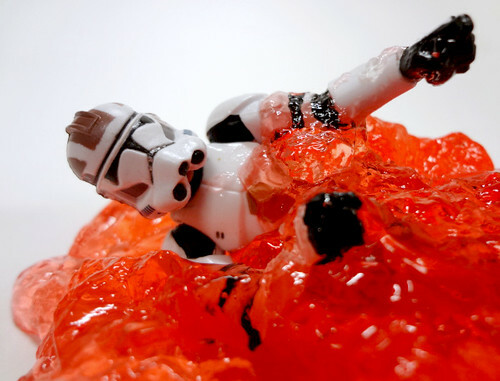 But until then, this review of a name brand, off-brand gelatin product will have to do. 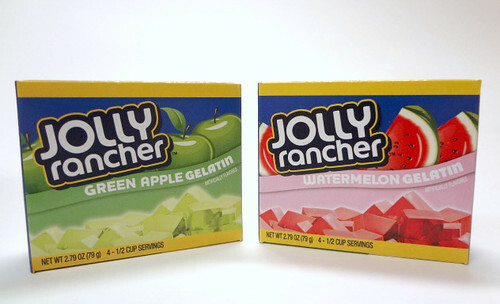 These two boxes jumped out at me because I don’t really run into the Jolly Rancher logo anywhere anymore. It seems to me they’ve lost a little street cred and a lot shelf space. Growing up, I was all about the Jolly Ranchers. The sticks to be specific. Sure the little Jolly Ranchers are great, but those long, flat sticks. Man. It also happens that Green Apple and Watermelon were and are my two favorite flavors. Actually, they might be everyone’s favorite flavors. Hence their selection for gelatinization. There’s not much to say about these. Neither the delightfully tart Green Apple nor the deliciously sweet Watermelon disappoint. They smell and taste exactly like their hard candy counterparts. I guess that’s not surprising. I don’t know how Jolly Ranchers are made (get on that, Mark Summers), but I imagine all incarnations could start as a powder. 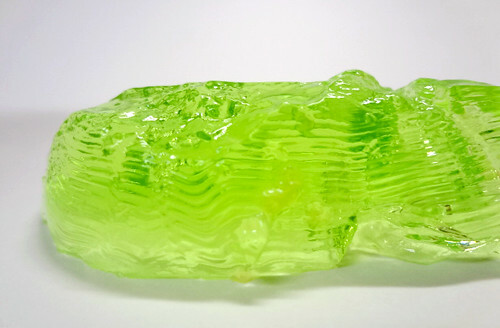 Maybe the gelatin just lacks a hardening agent? Seems reasonable. Also, The Hardening Agent is the tentative name of the new crime procedural I’m developing for the Food Network. If it’s been a while since you’ve caroused with some gelatin, maybe it’s time to get back in touch with your inner jiggle. Keep these in mind for your next powdered foods themed dinner party. Sure they’re not Jell-O, but your uppity bourgeois guests won’t mind. They’ll be too busy reminiscing about youthful days spent at the local convenience store dropping quarters on candy and the Final Fight machine. Just like there’s always room for Jell-O. Though again, this is not Jell-O. 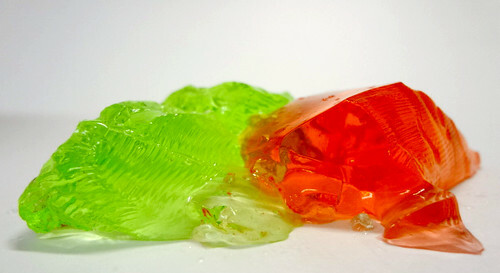 Just gelatin. But you knew what I meant. umm…what? where the HELL and why the HELL am I not seeing this anywhere? East coast thing maybe? Sounds amazing. I know! I’ve been to several stores since and haven’t seen them anywhere else. Most grocery stores in the Midwest have them. You should try that new Kool-Aid flavor, cherry limeaid. My kids love it. I must find that. Whenever I’m sick, the only thing I want in the world is lime Jell-O made with ginger ale. This sounds even better! I’m all over that the next time I get sick! After I did a review of Ghoul-Aid, I went back to Target after Halloween and bought 20 packs of it on clearance. My only regret is that I didn’t just clear them out. Have no shame! I’m so excited! I grew up in the Midwest, where me make Jell-O salad (Jell-O with fruit, or marshmallows, or nuts, which somehow makes it a salad.) I can’t wait to get these and create some new Jell-O salads! I too have grown up in the Midwest and this was always a favorite at holiday gatherings, especially Easter. Glad to see you back! The first photo is hilarious. Keep it coming. 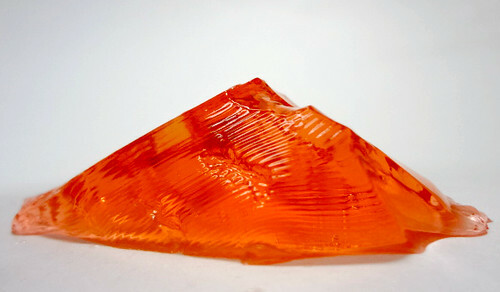 I just had a bowl of the watermelon Jolly Rancher Jello and it was so good! I wasn’t aware this was a product until a few months ago when I was sick and was wandering the aisles trying to find something that looked like something my sensitive stomach and scratchy throat would handle. I LOVE this product! When a story begins with “I’ve been getting into powders lately,” a part of me wants to draw the curtains and call the cops. They closed the factory in 2002 and the neighborhood lost it’s heady scent. By “they,” I mean the Evil Ones at Hershey, The Phantom Menace, who snapped up the poor Jolly Rancher brand and absorbed it into itself like some sort of giant, preservative-ridden succubus. I know things about Hershey. Horrible, sphincter-releasing things. I would love to live near a Jolly ranchers factory. It would be better than a bakery. Maybe. I think. Only they made Watermelon and Apple. Keep that Grape. YOU living near a candy factory? Isn’t that kind of like a junior high school residing near a crack house? Had a friend in high school who used to dissolve Smarties in Jolt Cola. He reminds me of you for some reason. Wow that’s a jolt indeed.